Politicians from Washington to New Delhi have argued for years that giving tiny loans to poor people to help them start or expand their businesses is a surefire way to help millions improve their lot in life and drastically reduce global poverty, especially among women. The idea has become such a central feature of foreign aid programs  USAID pours millions into such projects  that the microfinance industry has ballooned into a multibillion-dollar business operating in virtually every country on the planet. The question is, Does it work? Unfortunately, only sometimes. That's the conclusion of an exhaustive new study of programs around the world published on Thursday, Jan. 5, that details how many loans barely improve poor people's circumstances  or even leave them more desperate than before. "On current evidence, the best estimate of the average impact of microcredit on the poverty of clients is zero," writes David Roodman, author of the new book Due Diligence and a senior fellow at the Center for Global Development in Washington. Roodman's assessment is far afield from the enthusiasm microfinance programs have generated since the first institution for them, the Grameen Bank in Bangladesh, opened in 1976. The bank's founder, Muhammad Yunus, won the Nobel Peace Prize in 2006 and is probably the third world's most celebrated economist. The reality Roodman found is far more complex than Yunus' original idea that millions could be lifted out of poverty if they had access to credit  something regular banks have always been loath to offer. Roodman gathered evidence over three years from hundreds of lenders and borrowers in microfinance institutions  some with loans as small as $2  in part by blogging about the issue on the center's website and then posting his book online, chapter by chapter, as he wrote it, generating a furious global debate about the subject. His book is now finally published in full, and the findings are sobering. Although microfinance organizations have earned a reputation among U.S. and European aid agencies for having a remarkably high repayment rate on their loans  often a lot better than regular banks  Roodman found that some institutions' impressive repayment records come at a tragic price to borrowers. In Bangladesh, for example, one researcher found women frantically borrowing money from their equally poor relatives or choosing to forgo basic necessities in order to repay their microfinance loans. Most were terrified of what might happen if they defaulted  and had good reason to fear. 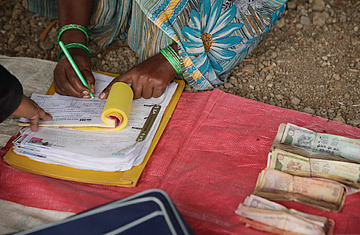 Many microfinance institutions geared to women operate through borrowers' groups, in which each member is responsible for carrying the unpaid loans of others  thus setting up intense peer pressure. "There are a fair number of stories where women cannot pay back their loans but they're in these groups," Roodman told TIME on Thursday. "So people come and take their roofs, flashlights, everything." Another failing of microfinance organizations, ironically, is  in a classic case of good intentions gone awry  the generosity of Western donors who have rushed to support antipoverty organizations that seem to yield concrete results. Besides the U.S., other major backers of microfinance programs in Africa, Asia and Latin America are the E.U. and the World Bank. "All the hype around microfinance has brought in more money," says Roodman. "There is probably an argument to grow carefully, step by step." Instead, he says, there is "too much easy money from do-gooders." It has allowed institutions to lend money to people who might never be able to repay the debts and given them little incentive to generate their own funds. In addition, a 2004 U.S. law requires half of Washington's microfinance funds to go to very poor people, which Roodman believes increases the risks in their lives. "It is contrary to common sense," he says. Roodman says the microfinance industry's giant success has allowed it to ignore perhaps the best way for poor people to improve their economic prospects: saving money. Organizations have for years taken donations, then distributed that money to borrowers. Far from the perception that poor people have no money to save, Roodman found that many would prefer to save money for future emergencies than to borrow cash to cover their immediate needs. "The more money we lend to microfinance institutions, the more they can say we don't have to worry about savings," Roodman says. "Poor people can save  they just want safe places to do it." Those changes are coming  in part because of challenges like Roodman's to the vaunted microfinance industry and in part because big institutions like Grameen (now headquartered in a skyscraper in Bangladesh's capital, Dhaka) have become major savings banks. The challenges are not only from analysts like Roodman. The industry's greatest shake-up might come in the form of mobile phones; phone-banking organizations like Kenya's MPESA program are spreading in Africa. With billions of mobile phones in the hands of poor people, Roodman believes phone banking will soon overhaul the way microfinance operates  perhaps presenting a phone-banking visionary a chance at some future Nobel prize. See photos of microlending pioneer Muhammad Yunus.